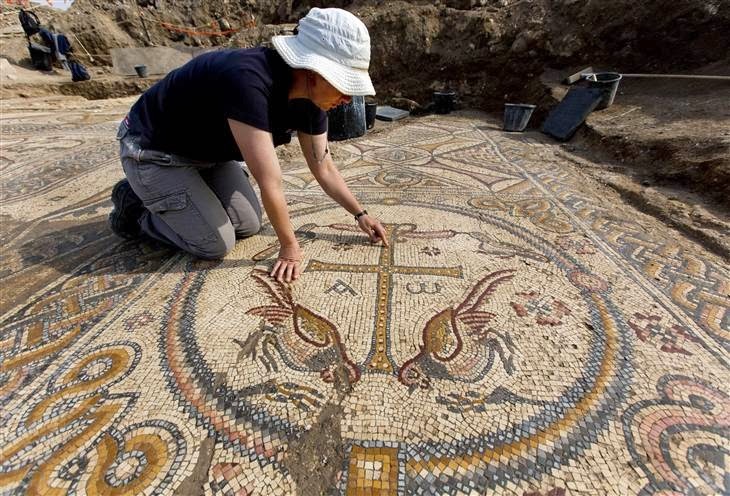 A 1,500-year-old mosaic floor with colorful images of animals, botanical and geometrical designs has been brought to light during the excavation of a Byzantine-era Christian church in southern Israel. "The church probably served as a center of Christian worship for the neighboring communities," the Israel Antiquities Authority said in a news release about the find, issued Wednesday. The floor and other remains of the basilica were found over the past three months during preparations for the construction of a new neighborhood at Moshav Aluma, the agency said. The church was part of a major Byzantine settlement located next to the main road running between Ashkelon on Israel's Mediterranean coast and Jerusalem to the east. Previous excavations along the road had found traces of other communities from the same period, but no churches. The mosaic that was in the church's main hall features 40 decorative medallions. Some of the medallions depict animals including a zebra, a leopard, a turtle, a wild boar and various types of birds. Three medallions contain Greek inscriptions that commemorate two church leaders named Demetrios and Herakles. When we think about the Gospels we often think about written documents. Indeed, much of the study related to the Gospels has been on how they were written. But a growing number of New Testament Scholars over the last two decades have taken seriously the idea that before there was a written gospel, the story of Jesus was circulated orally. James D.G. Dunn is one who has been working in this area beginning with his Jesus Remembered. (Eerdmans, 2003) His latest work is the Oral Gospel Tradition (Eerdmans, 2013). Below is an interview in which Dunn talks about how oral tradition impacted the creation of the Gospels.